We have developed many excellent thinking tools for argument and analysis. Our information technology methods are constantly improving. But we have developed few tools to deal with our ordinary everyday thinking-the sort of thinking we do in conversations and meetings. In fact, our traditional thinking methods have not changed for centuries. While these methods were powerful in dealing with a relatively stable world (where ideas and concepts tended to live longer than people), they are no longer adequate to deal with the rapidly changing world of today where new concepts and ideas are urgently needed. The fall of the Roman Empire in Europe was followed by the Dark Ages. The so-called barbarian hordes swept across what had been the civilizations of Rome and Greece. Scholarship, reading, writing, and thinking were only preserved in the great monasteries and abbeys of the Church. Naturally, the thinking that took place in the monasteries and abbeys was concerned with theology and with preserving the doctrine and dogma of the Christian faith. Then came the Renaissance. The Renaissance was brought about by the discovery of the classic thinking methods of the ancient Greek philosophers. This “new thinking” provided a breath of fresh air. Humanity was given a more central role in the universe. Thinkers were allowed to use reason to work things out. Logic was now allowed. It is hardly surprising that this new thinking was eagerly embraced by the “humanists” or non-church thinkers because it gave them a framework for thinking and also for challenging the church. At the same time, this new thinking was embraced by church scholars such as Thomas Aquinas of Naples, who fashioned Aristotelian logic into a powerful, argumentative way of proving heretics wrong. So the two main thinking groups in Western culture adopted, with eagerness, this classic Greek thinking. To this day, Western culture depends on this type of thinking. 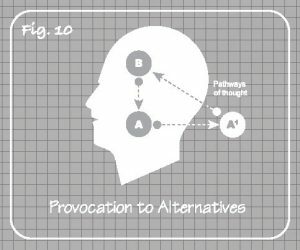 In family arguments, in business discussions, in the law courts, and in governing assemblies, we use the thinking system of the Greeks, based on argument and critical thinking. I sometimes refer to prominent philosophers of this day as the “gang of three.” Who were the famous Greek gang of three, and how did they form the thinking habits of Western culture? Socrates was trained as a “sophist.” Sophists were people who played with words and showed how careful choice of words could lead you to almost any conclusion you wanted. Socrates was interested in challenging people’s thinking and, indeed, getting them to think at all instead of just taking things for granted. He wanted people to examine what they meant when they said something. He was not concerned with building things up or making things happen. Plato is generally held to be the father of Western philosophy. He is best-known for his famous analogy of the cave. Suppose someone is bound up so that the person cannot turn around but can only look at the back wall of the cave. There is a fire at the mouth of the cave. If someone comes into the cave, then the bound person cannot see the newcomer directly but can only see the shadow cast by the fire on the back wall of the cave. So as we go through life, we cannot see truth and reality but only “shadows” of these. If we try hard enough and listen to philosophers, then perhaps we can get a glimpse of the truth. From Plato we get the notion that there is the “truth” somewhere but that we have to search for it to find it. The way to search for the truth is to use critical thinking to attack what is untrue. Aristotle was the pupil of Plato and the tutor of Alexander the Great. Aristotle was a very practical person. He developed the notion of “categories,” which are really definitions. So you might have a definition of a “chair” or a “table.” When you come across a piece of furniture, you have to judge whether that piece of furniture fits the definition of a chair. If it does fit, you say it is a chair. The object cannot both be a chair and not be a chair at the same time. That would be a “contradiction.” On the basis of his categories and the avoidance of contradiction, Aristotle developed the sort of logic we still use today (based largely on “is” and “is not”). From Aristotle we get a type of logic based on identity and non-identity, on inclusion and exclusion. So this was the gang of three. The outcome was a thinking system based on the search for the “truth.” This search was going to be carried out by the method of argument. Within argument there was to be the critical thinking that sought to attack “untruth.” This attack was going to use the methodology of Aristotle’s logic.